Below are the fun things to do in Malibu that are perfect for all types of travelers including families. When you are visiting Malibu you can see incredible architecture at the Getty Villa as well as a museum packed with antiquities from Greece and Rome. The Malibu Lagoon State Beach is home to the Adamson House which is referred to as the Taj Mahal of Tile, the Malibu Pier and the world famous Surfrider Beach. You have several options to view gorgeous coastal landscapes at places like El Matador State Beach, Point Dume State Beach and Preserve as well Point Mugu State Park. 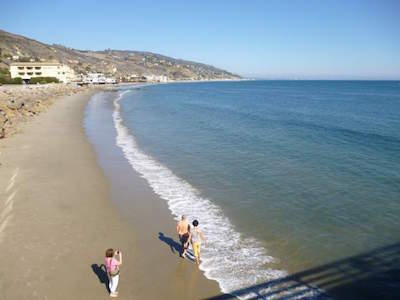 Beach goers will like Zuma Beach, Westward Beach and swimming is perfect Paradise Cove. There are numerous outdoor adventures that include horseback riding, hiking in wine country and viewing exotic animals while you travel through a private ranch in an open air vehicle. 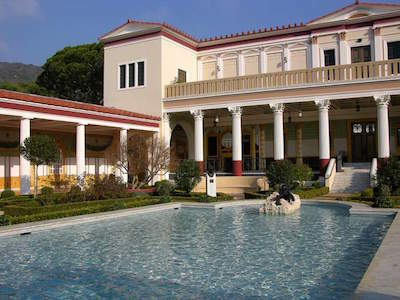 When you want to see an incredible Roman and Greek estate that has been reconstructed for the public to experience then the best thing to do in Malibu is to plan a trip to the Getty Villa. Located in the Pacific Palisades off of the Pacific Coast Highway, the Getty Villa is situated on 64 acres on top of a hillside that overlooks the Pacific Ocean. The Getty Villa was constructed in the 1950s and represents a grand villa of Roman and Greek architecture with manicured gardens that feature plants from around the world. When you step inside you will be delighted when your mind is transported to the ancient days of these cultures. The grounds house a museum which contains over 44,000 artifacts from sculptures to paintings to coins to literature. The Getty Villa contains a 450 seat Greek theater and a 250 seat auditorium where guests can listen to guest lectures as well as learn more about the cultures of the Etruria, Greek and Roman people. One of the most iconic things to do in Malibu that brings alive the surfing and beach culture of the area is to visit the Malibu Pier. Located in the Malibu Lagoon State Beach, the Malibu Pier is adjacent to Surfrider Beach which is famous for having three points of surf break. The Malibu Pier was originally constructed in 1905 and was held in private ownership until 1980 when the State of California purchased the pier. The Malibu Pier is perfect for fishing and watching the incredible surfing that takes place at Surfrider Beach and you will be able to charter a boat as well as plan other watersport adventure while at the pier. 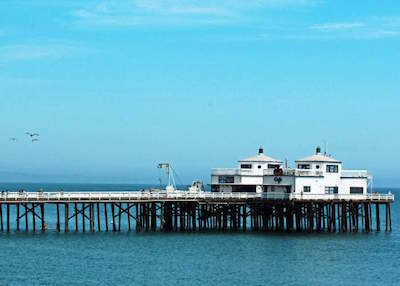 The Malibu Pier is home to the Malibu Farm Cafe and Restaurant where you can indulge in farm to table cuisine. Adjacent to Surfrider Beach and the Malibu Pier is the Adamson House and Malibu Lagoon Museum which makes for an ideal stop to add to your vacation when you visit the pier. One of the more unique things to do in Malibu when you are interested in combining hiking and tasting wine is to take a Malibu Countryside Wine Hike. Located at the 1,000 acre Saddlerock Ranch you will be thrilled with this 2.5-mile moderate hike that will take you through the Santa Monica Mountains while you explore the scenery and even an ancient Chumash Indian pictograph called the Cave of the Four Horsemen. As you hike through this natural landscape you will learn about the different varietals of wines within the vineyards as your expert tour guide explains the grape growing process. The natural scenery is enhanced by several exotic animals that you will encounter on your hike that include camels, zebras, giraffes, bison and alpacas. When you are finished with your exhilarating hike you will treat your taste buds to six of the incredible wines that are produced at Saddlerock Ranch. This excellent opportunity to view exotic animals, ancient pictographs, stunning scenery and learn more about different wines is sure to leave lasting memories for everyone. One of the most popular things to do in Malibu for beach goers and for watching people is to plan a day at Zuma Beach. Located upcoast of Point Dume State Beach and Preserve, Zuma Beach has a wide 1.8-mile stretch of sand which is popular throughout the year and is accessed directly from the Pacific Coast Highway. Because of easy access to Zuma Beach you will need to arrive early for a prime spot on the sand. Zuma Beach has everything for beach goers from lounging on the sand to beach volleyball courts to a gradual sand shelf that allows for water activities such as body surfing and swimming when the rip currents permit. Other popular activities include surfing, windsurfing and kiteboarding as well as watching migrating whales during the winter months. Zuma Beach has been highlighted many times in the television series Baywatch and the beach also several events throughout the year such as the Malibu Nautica Triathlon. 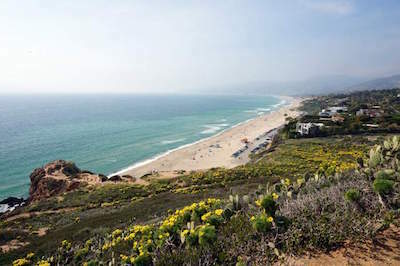 The southern portion of Zuma Beach is named Westward Beach which provides access to Point Dume. Facilities include lifeguards, playground, restrooms, showers, picnic areas and a concessions stand. 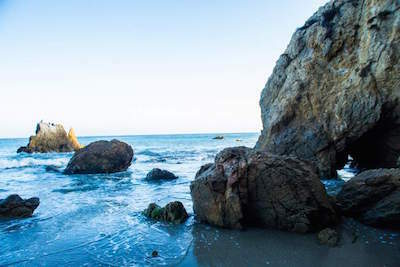 Planning a trip to El Matador State Beach is an ideal thing to do in Malibu when you want a nice beach area where you will find plenty of interesting natural landscape. Located upcoast from Point Dume State Beach and Preserve within the Robert H. Meyer State Beach, El Matador State Beach is adjacent to El Pescador and La Piedra Beaches and is one of the most photographed beaches in the area. Accessed from the Pacific Coast Highway, El Matador State Beach can be reached by climbing down a steep staircase through interesting natural rock formations. Once on the sandy beach you will be thrilled with the natural scenery that includes seat stacks, coves, sea caves and arches. Water activities range from snorkeling to boogie boarding to windsurfing to swimming when the rip currents permit. Beach combing is popular through the sea caves and beach coves during low tide. During the winter months marine life viewing is popular from the top of the bluffs. The only facilities available are in the parking lot where you will find restrooms and picnic tables. One of the best outdoor things to do in Malibu is to take a trip to Point Dume State Beach and Preserve where you will find numerous activities on land and in the water. Located northwest of Malibu, Point Dume State Beach and Park consists of a long bluff that forms the north end of the Santa Monica Bay and contains 1-mile of coastline as well as 34 acres of sandy beach areas which can be accessed from Cliffside Drive off of the Pacific coast Highway or from Westward Beach. Point Dume State Beach and Preserve has numerous bluffs, rocky coves and sea caves for you to explore. Water activities include surfing, fishing and there are excellent scuba diving opportunities for strong swimmers. Beachcombing and tide pooling are good and when you find Pirates Cove the swimming is ideal close to the shoreline. Land based activities include several miles of hiking trails and novice rock climbers take advantage of the easy routes where ropes already exist. During the winter months the bluffs offer superb viewing opportunities for spotting migrating whales. Facilities include lifeguards, restrooms, showers and picnic areas. 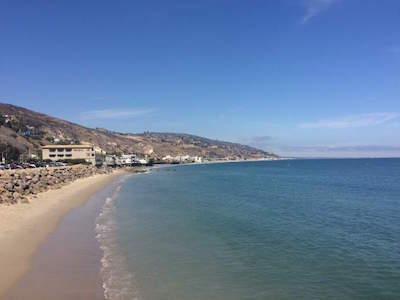 Visiting Paradise Cove Beach is one of the most relaxing fun things to do in Malibu when you want easy access to a superb beach area that boasts plenty of onsite amenities. Located between Malibu and Point Dume along the Pacific Coast Highway, Paradise Cove Beach has an excellent wide stretch of sand that is perfect for families. 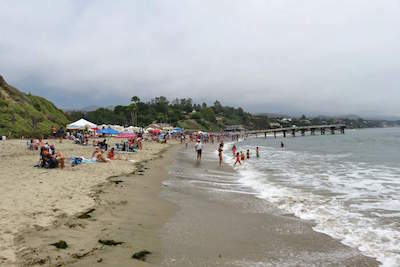 Paradise Cove Beach is often confused as a private beach but there is public access. When you arrive at Paradise Cove Beach you can choose to park on the Pacific Coast Highway and walk in or pay for close up parking. You can rent beach equipment onsite through Paradise Cove Cafe or bring your own. Swimming at Paradise Cove Beach is superb with few swells and rip currents which makes conditions great for families. Other activities include surf fishing from the private pier, beachcombing and tide pooling. Facilities include lifeguards, restrooms, pier, showers and the full service Paradise Cove Cafe. 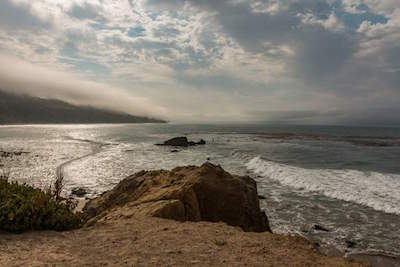 When you are seeking an outdoor adventure that includes numerous activities both on land and in the water then you should take a trip to Leo Carrillo State Park and Beach. Located northwest of Malibu between Point Mugu State Park and Point Dume Nature Preserve, Leo Carrillo State Park and Beach contains 2,513 acres with 1.5-miles of beach which is encompassed within 2.5-miles of rugged coastline and is accessed from the Pacific Coast Highway. Leo Carrillo State Park and Beach provides an outdoor playground for all travelers who like to spend time in the outdoors whether on land or in the ocean. Coastline adventures include an excellent beach area for lounging to exploring coastal sea caves to tide pooling and there are plenty of watersport activities like surfing, scuba diving, surf fishing, windsurfing and swimming when the rip currents permit. Land based activities include bike riding, marine life viewing from the bluffs and there is 7-miles of hiking trails that range from novice to expert. There is also a shaded campground area for overnights. Other facilities onsite include showers, restrooms and picnic areas. When you want to experience numerous activities in one place that includes relaxing on the beach, surfing, historic architecture, bird watching and a sport fishing then the best thing to do in Malibu is to visit Malibu Lagoon State Beach. Located where Malibu Creek enters the Pacific Ocean, Malibu Lagoon State Beach is situated on 110 acres of coastline and can be accessed from the Pacific Coast Highway. Malibu Lagoon State Beach which is anchored by Surfrider Beach is one of the finest surfing areas in the world with three distinct surfing points which are perfect for all types of surfers from novice to professional. The historic Adamson House has a Spanish Colonial Revival design with exquisite tile work and is referred to as the Taj Mahal of Tile. The Malibu Lagoon Museum is superb for learning about the Chumash Indians to present day Malibu. The Malibu Lagoon is home to over 200 species of birds and the Malibu Pier is perfect for surf anglers. The beach park also offers several miles of nature and hiking trails. Other facilities at Malibu Lagoon State Beach include lifeguards, restrooms and picnic areas. When you want to combine plenty of Pacific Ocean shoreline with beautiful mountains and numerous activities in as well as out of the water then the perfect thing to do in Malibu is to take a trip to Point Mugu State Park. Located northwest of Malibu in the Santa Monica National Recreation Area, Point Mugu State Park has 14,000 acres of natural bluffs, two river canyons, grassy valleys, sand dunes and 5-miles of coastline along the Pacific Ocean. Point Mugu State Park can be accessed from the eastern side from Rancho Sierra Vista and on the western side from the Pacific Coast Highway. Point Mugu and Thornhill Broome Beaches boast large swaths of sand to help you relax with watersport activities that range from windsurfing to kiteboarding to scuba diving to swimming when the rip currents permit. During the winter months the coastal bluffs Park are perfect viewing spots for migrating whales, seals and dolphins. Point Mugu State Park has an incredible 70-mile hiking trail system and there are numerous land based activities that range from horseback riding to mountain biking to camping to wildlife viewing. Facilities at Point Mugu State Park include 2-campgrounds, restrooms, showers and picnic areas. When you are looking for a nice beach area which is good for lounging and watching surfers then an ideal thing to do in Malibu is to visit Westward Beach. Located northwest of Malibu on the southern half of Zuma Beach, Westward Beach boasts a 1.5-mile stretch of sand which offers plenty of space to relax. Accessed off of the Pacific Coast Highway, Westward Beach does not have very good swimming conditions and caution should be taken even by strong swimmers. The surfing at Westward Beach is great because of a shorter sand shelf which makes the waves more powerful but also shorter in duration. Other popular water activities are kitesurfing as well as surf fishing and if you are looking for beach volleyball you will need to head to Zuma Beach. 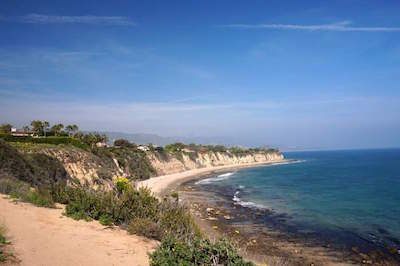 Adjacent to Westward Beach is Point Dume Nature Preserve which can be reached by a series of hiking trails from Westward Beach. Another interesting highlight is Pirates Cove Beach which can be reached by bouldering over a rock wall near the southern end of Westward Beach. Facilities include lifeguards, restrooms, showers, picnic areas and the Sunset full service restaurant is open for lunch as well as dinner. One of the best things to do in Malibu for beach goers looking for a great day of relaxing on the sand is to stop at Surfrider Beach. Located within the Malibu Lagoon State Beach, Surfrider Beach has about 1-mile of splendid beachfront and is accessed from the Pacific Coast Highway. Surfrider Beach was made popular during the 1950s-1960s through a variety of surfing movies and today is a popular place for surfers from novices to experts. Surfrider Beach boasts nice sand where you can lounge and there is a beach volleyball court near the pier. The beach area has designated swimming and surfing areas which helps maintain safety at the beach. Surfers flock to this beach for the incredible right-hand wave break which seems to last forever until you reach the shoreline. Swimming within the designated area is generally good with small swells and calmer waters. The Malibu Pier is great for anglers of all ages and the adjacent Adamson House and Malibu Lagoon Museum are great places to learn the history of the area. Other facilities at the beach include lifeguards, restrooms and picnic areas. 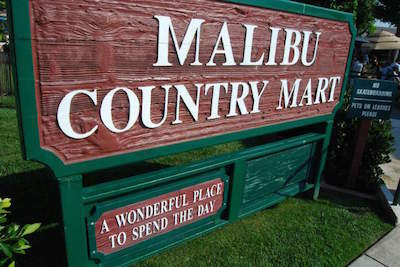 If you like visiting outdoor venues that include shopping, dining and entertainment then an ideal thing to do in Malibu is to stop at the Malibu Country Mart. Located in the heart of Malibu Civic Center, the Malibu Country Mart is situated on 6 acres of land which is nestled between Legacy Park and the Malibu Lagoon. Malibu Country Mart boasts a unique experience with more than 60 venues from high-end boutiques to art galleries to eateries to health and beauty spas. Some of the clothing boutiques include 7 for All Mankind, IL Sandalo, Malibu Lifestyles, Planet Blue and PAIGE. Other boutiques range from home furnishings from Room at the Beach and Malibu Colony Company to specialty toys for children at Toy Crazy to Malibu Acupuncture as well as the Beauty Collection for health and wellness products. Dining is fabulous with such restaurants as Malibu Mutts Grill, Mr. Chow, Taverna Tony and Tra di Noi. Families will be pleased with the various picnic areas spread throughout the complex and children can unwind at a nice modern playground. One of the best things to do in Malibu for families seeking an outdoor adventure with wildlife sightings as well as a bit of adrenaline is to visit Horseback Riding Los Angeles and go horseback riding. Horseback Riding Los Angeles is located on 10-acres of natural landscape at the Connemara Ranch in Malibu, California. This adventure is perfect for all types of riders from novice to expert. You will be delighted when you meet your horse that will be perfect for you based on your riding experience. There are several options for you to choose that range from riding lessons to scenic trail rides to caring for your horse. While you are riding you will experience breathtaking scenery from mountain landscapes to tranquil meadows to gorgeous views of the Pacific Ocean while riding along a ridgeline. One of the more aesthetically pleasing things to do in Malibu for everyone who likes interesting historic architecture and manicured gardens is to visit the Adamson House and Malibu Lagoon Museum. Located adjacent to Surfrider Beach within the Malibu Lagoon State Beach, the Adamson House and Malibu Lagoon Museum was constructed in 1929 with a Spanish Colonial Revival architectural design and is listed on the National Register of Historic Places. Also known as the Taj Mahal of Tiles, the Adamson House is packed with intricate tile features such as fountains, benches, mantles and walls. Other features inside the house include hand-painted murals, hand-carved doors, lead glass windows and plenty of hand-crafted filigree ironwork. The house serves as a reminder of years gone by with plenty of period fixtures and furnishings. The gardens that surround this magnificent piece of architecture are superb with plenty of native plants within this tranquil setting. While you are visiting be sure to stop in at the Malibu Lagoon Museum which is housed within the original 5-car garage and now tells the story of the Malibu Lagoon from the Chumash Indians to present day. When you want to mix a great tasting wine with an outdoor sightseeing adventure then the perfect thing to do in Malibu is to try the Malibu Wine Safari. Located north of Malibu off of Mullholland Highway, Malibu Wine Safaris is situated on the 1,000 acre Saddlerock Ranch where you will explore the vineyards and exotic animals while you ride in an open air custom built safari vehicle. Malibu Wine Safaris is great for everyone including families and children will be thrilled with watching zebras, bison, alpacas, camels and giraffes up close. As you tour the Saddlerock Ranch you will be able to hand feed many of the animals which will help you shoot superb photographs of your children with these exotic animals. 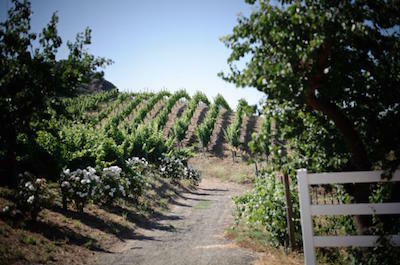 Adults will enjoy a splendid wine tasting after touring the Saddlerock Ranch which can include up to six different varietals from zinfandel to chardonnay. 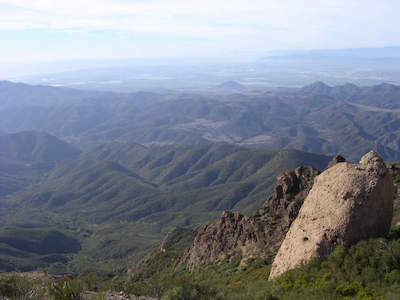 The overall environment of the Santa Monica Mountains is beautiful with rolling hillsides, mountainous overlooks as well as plenty of other natural landscapes.